Hydrolyzed Whey Protein Phospholipid Hybrid, Cocoa Powder (Dutch Process), Natural & Artificial Flavors, Gum Blend (Cellulose Gum, Xanthan Gum, Carrageenan), Soy Lecithin, Enzymes, Acesulfame Potassium, Sucralose. Use this product as a food supplement. Do not use for weight reduction. Contents packaged by weight - not volume. Some settling may occur. Keep out of reach of children. Store in a cool dry place. Introducing MyoGenin, a revolutionary new 2-phase, leucine-specific, hydrolyzed whey protein phospholipid hybrid, engineered with ground-breaking, Integrated mTOR Activation Technology. This advanced and very unique protein hybrid incorporates a special hydrolyzed whey protein that is integrated with 2-stage, target-specific active enzymes engineered with new phospholipid technology to release higher levels of leucine peptides in the body. Unlike other hydrolyzed proteins where peptides are randomly cut from the protein chains, MyoGenin specifically cleaves leucine from its peptide attachment. This leucine-specific hydrolysis and integrated enzyme technology in MyoGenin is the pinnacle of protein science. The leucine peptides from MyoGenin activate mTOR to dramatically increase muscle-building protein synthesis. * MyoGenin is truly an engineered protein like no other. With MyoGenin, you’re not just consuming grams of protein, you are taking an “Active Protein Substrate” that is engineered to deliver specific signals that trigger protein synthesis. 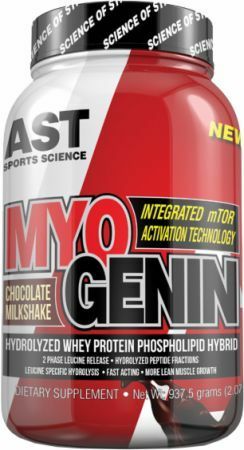 While providing a potent protein punch, MyoGenin’s Integrated mTOR Activation Technology sets it above all other protein supplements. With MyoGenin, the game has changed.